Translatorgigs.com matches all types of language professionals with the clients who needed their skills. All you need is to create an account, and you are connected to the world's best clients or professionals. Here's a step-by-step guide to getting started at translatorgigs.com. Click the "Sign Up" link on the translatorgigs.com home page. Registration is free! On the Sign Up page, choose either "Client" if you want to hire a translator, or "Translator" if you want to be a professional. Enter your email address plus a username and password in the boxes provided. Confirm your password. Click "Submit" and you're in! After registration, you'll be taken to your translatorgigs.com Dashboard. Now the next thing is to complete your profile. If you're a translator, a complete profile will increase your chances of winning jobs. If you're a client, the profile will help you build your employer reputation and be able to hire better translator. Once you are done with your profile, you're all set! You can now start bidding on projects if you're a translator or start posting projects if you're a client. After creating a translator's account you need to complete your profile in order to increase your chances of getting hired. You can edit your profile by clicking the "Settings" link in the header of your dashboard. The next step is to search for projects as per your skills. You can click on the "Browse Projects" link in the header of your dashboard for browsing the projects from the different clients. You can also search projects that match your skills by entering your skills in the skills box in the "Browse projects" page. Once you have found your project, now you can bid on that project by clicking on "Bid Now" button. Make sure you have purchased the translatorgigs 1 year memmbership(Unlimited Bids), because without that you are not allowed to place bid. Enter your bid amount, completion days and proposal in the box provided. If you wants to create milestones(maximum 4 milestones are allowed), then hit "Add Milestone" button. You can define the task and amount in the given box. If you not created one then default milestone will be created of youe bid amount. Click "Submit Bid" button and you'll be able to see your bid in the bids list. Congratulations! You have successfully made your first bid! There is also "Sponsor my Bid" option. With this, you'll be able to move your bid to the top of the bid list by paying a sponsorship amount. Edit Bid - Click this to change any details in your bid. After bidding you'll be awarded project by the client and you have to accept the request. Now once you have completed the project, you can send request for the payment of the project to the client. On the "My Bids" page's bids list, click on the project name and hit the "MILESTONE RELEASE REQUEST" button under "Milestones" tab. Once your request has been accepted by the client and you have received the payment, you can rate the client now. In order to pay for site fees(e.g. 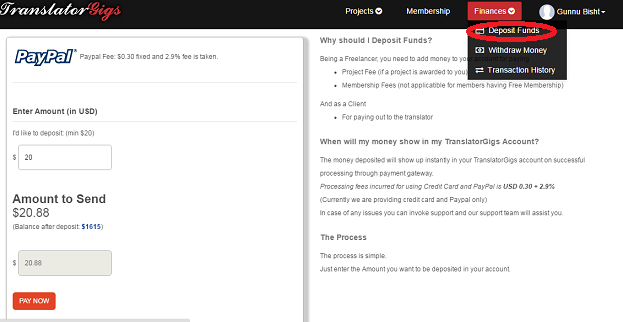 membership fees) or sponsor bids, you have to maintain your account balance by depositing money through paypal by clicking on the "Deposit" link in the "Finances" tab in the header of your dashboard. You can also withdraw money from your account clicking on the "Withdraw" link in the "Finances" tab in the header of your dashboard. 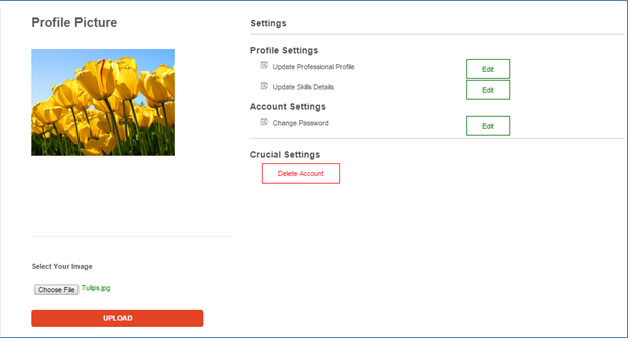 After creating a client's account you need to complete your profile which will help you build your employer reputation and be able to hire better translator. You can edit your profile by clicking the "Settings" link in the header of your dashboard. The next step is to post a project. Click on "Post Project" in the header of your dashboard. Enter project title and describe your project clearly. For example: Enter "Document Translation" in the title field and describe details of the text or source materials in the project description. The more details you provide the easier it will be for translators to evaluate your project. Once your project is posted, we will connect you to skilled translators from all across the world. Professional translators will evaluate your project and send competitive bids. You can choose the translator on the basis of their ratings and recommendations and hence award the project accordingly. Awarding of project can be done on clicking the project name which will redirect you to the project details page where there is "Award Project" link on the right of every bid entry. The final step is to rate the freelancer once the project is completed as it would help other in hiring and you are done! In order to pay translators, you have to maintain your account balance by depositing money through paypal by clicking on the "Deposit" link in the "Finances" tab in the header of your dashboard.